Color plus B&W, VHS, approximately 40 minutes. 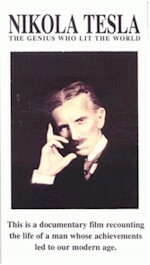 Produced jointly by the Tesla Memorial Society and the Nikola Tesla Museum in Belgrade, this fine biographical video details various aspects of Tesla's pioneering work in electrical and mechanical engineering. Some of the museum's dynamic demonstrations of the rotating magnetic field and the induction motor, the Tesla oscillator and high-frequency lighting, and the disk pump and turbine are shown. There are also many views of the museum's archival exhibits which include glimpses of original, seldom seen Tesla turbomachinery.